Welcome to the CSRP Web site. Our goal here is to provide you with useful information about our company and products. CSRP has been manufacturing disc brake conversion and replacement parts since 2004. CSRP specializes in disc brake conversion parts and kits for Classic Mustang and other Falcon chassis based Ford automobiles from the early 60's to late 70's. We are committed to providing quality and high value kits with standard premium content and excellent performance. 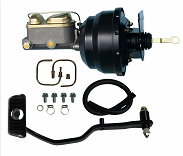 All CRSP kits are equipped with premium slotted rotors, adjustable push rods, master cylinders with correct residual pressure valve, a complete under the hood sure connect brake line and hose kit to plumb the master cylinder and proportioning valve to the distribution block, metal master cylinder bench bleeding kits, a conveniently mounted adjustable proportioning valve, corrosion protected calipers and caliper brackets, correct grade and configuration attachment hardware, correct rotor dust/slash shields, and braided stainless steel brake hoses. Our operating philosophy is to provide simple and quality products with great value. We intend to stay close to our customers. We will maintain our quality and value leadership through strict control of our supply chain. Feel free to browse around this site. If you have comments or questions about our products or services, or simply need more information and want to contact us, click on the contact button at the left. We will gladly receive your calls.